…and so begins The Great Pumpkin Dilemma. You cook or bake something with pumpkin and end up with leftover pumpkin. What to make…what to make? Preheat oven to 325 degrees. Combine oats, pumpkin pie spice, cinnamon, nutmeg, salt and brown sugar in a large bowl. In another bowl, combine pumpkin, syrup, applesauce and vanilla. Pour wet mixture into dry mixture, and toss until oats are all coated. 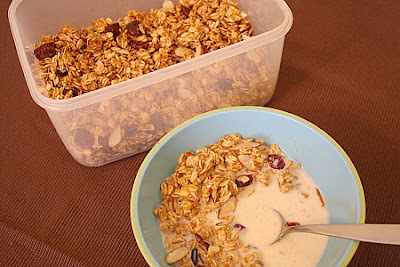 Spread granola evenly onto a foil lined baking sheet. Bake for 20 minutes, then remove from oven and stir around. 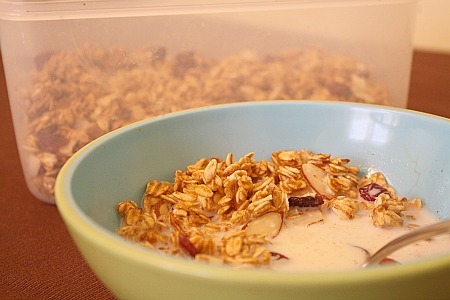 Bake for another 20 minutes or until granola gets crisp. 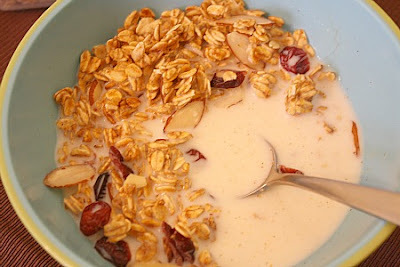 Take out of oven and let cool for 2 minutes, then add cranberries and almonds and mix. 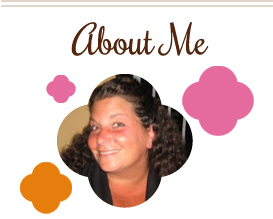 This entry was posted in almonds, breakfast, nuts, pumpkin, snacks. Bookmark the permalink. Mmm, pumpkin granola! My favorite breakfast in the fall!